Yesterday, the EXPO REAL 2016 opened in Munich, Germany. As in recent years, FRIS is present at this well-known international trade fair for real estate and investment to inform, get informed, meet partners and clients, and new connections. One of the hot topics for the Dutch is the residential investment market. While in the past the Dutch market was dominated by local investors, the market has noticeably caught the attention of foreign investors. In line with that, Deutsche Asset Management (Deutsche AM) placed the Netherlands among the locations with the most attractive returns on a risk-adjusted basis in its semi-annual outlook on the European property market published last week. But what is it that makes the Dutch residential market such an interesting target for investment? 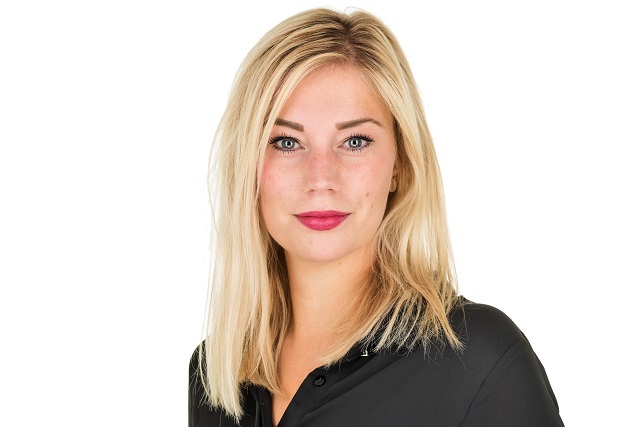 In this blog, Svenja de Rijk from FRIS Research & Consultancy shows why the Dutch residential market offers a good investment climate from an international point of view. If you want to know more about the types of housing and locations with attractive investment opportunities, read the whitepaper on the residential market that FRIS published this summer. 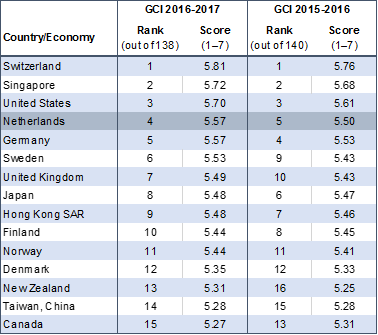 The Netherlands continues its climb toward the top of the Global Competitiveness Index (GCI). Over the period 2016-17, the Netherlands ranks fourth on the World Economic Forum’s list of the world’s most competitive countries. Overall, the Netherlands ranks in the top 10 in the fields infrastructure, health and primary education, higher education and training, goods market efficiency, technological readiness, business sophistication, and innovation. The rate of competitiveness can be interpreted as an indicator for the sustainability of a country’s economy and the ability of its businesses and people to prosper over the long-run. A stable social-economic environment is essential for low-risk, long-term investment. A more competitive economy is one that is likely to grow faster over time, which makes the market more attractive for investments. Dutch residential property offers stable returns. Although current returns on investment are not overwhelming, they are higher than those in many other countries. Especially given the generally vibrant economy and secure investment environment, the Netherlands offers good investment prospects. 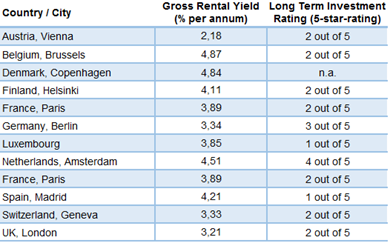 Global Property Guide rates the long-term appeal of the Dutch residential market with four out of five stars. The rating is based on various factors such as gross rental yield, income and capital gains tax, landlord and tenant rights, long-term GDP growth, and potential over-supply and affordability. Demographic trends continue to exert pressure on major cities in the Netherlands. Especially in large cities, the population will increase significantly due to the ongoing urbanization. Besides the increase of the total population, the growing number of smaller households (singles and two-person households) results in increasing housing demand in the medium term. Forecasts predict an increase of households from currently approximately 7.7 million to 8.4 million households by 2030. 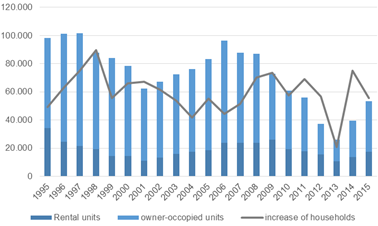 Due to the difficult financing conditions for project developers during the financial crisis, housing completions reached an historic low in 2013 and 2014. Although the construction volume picked up in 2015, production is still much lower than before the crisis. The growth in the number of households and the limited construction are expected to lead to a housing shortage. Especially in and around the four largest cities: Amsterdam, Utrecht, Rotterdam and Den Haag. Compared to other European markets, both, home ownership and regulated social housing, feature an above-average share of the Dutch housing stock. 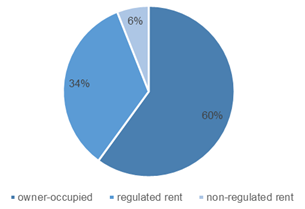 On the other hand, only 6% of all housing units are attributed to non-regulated rental housing. At the same time, demand for non-regulated rental housing increases. New regulations, put in place by the Dutch government in order to cope with the housing crisis, limit the accessibility of the regulated social housing segment and reduce financial stimulations of home ownership. As a consequence, households are forced into the regulated sector. Additionally, more flexible lifestyle choices require more flexible housing solutions. Particularly in large cities, a change of housing preferences is noticeable, characterized by a shift of preference from owning to renting. 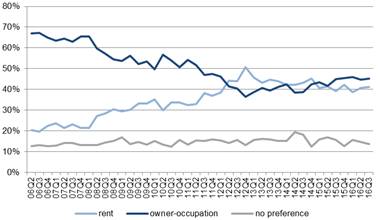 Changed lifestyle choices and limited access to either social housing or home ownership put pressure on the very tight non-regulated rental market and result in a general shortage of liberalized rental housing in the Netherlands. Notably, mid-priced rental housing in the price range € 700 to € 1,000 per month in urban locations is popular. Cities, such as Amsterdam and Utrecht, are symbolic for the scarcity of good quality liberalized rental properties in urban locations. This blog shows that the Dutch residential market offers great investment opportunities. The investment climate is secure and the Netherlands remains one of the most competitive economies in Europe. The market offers stable returns that exceed the yield level of many other European markets. Due to house price declines during the financial crisis, Dutch property is still comparably attractively priced. The growth of the number of households forms a solid base for future housing demand that exceeds current supply levels. New regulations on the housing market shift the demand for housing towards the tight non-regulated rental segment. If you want to know more about the Dutch property (investment) market, do not hesitate to contact us. FRIS Research & Consultancy offers detailed information about the Dutch housing market. By combining market information, gathered and processed in our in-house database, with years of market experience of our consultants, FRIS provides valuable insights in regard to housing supply and demand on macro and micro level.